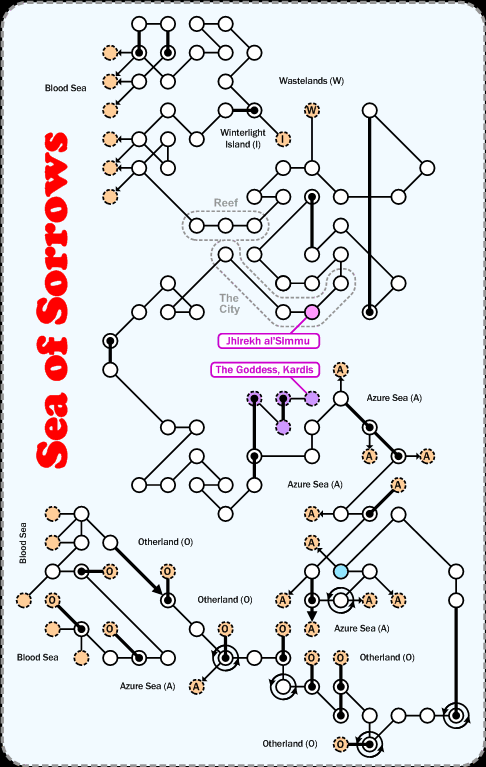 Sea of Sorrows is a lonely, desolate place. It's bordered by the Blood Sea in the west, Azure Sea in the East (mostly), Wastelands in the North and Otherland in the South. The section in the bottom-left of the map can only be reached by travelling through Otherland. Walk ( 6s, ne, 2s, se, 2e, s, 2sw, s, 2e, u, 3e, 3s, se, 3e, s, 2se, 3s, sw, w, sw, d ) to get from DH to the room marked in blue.